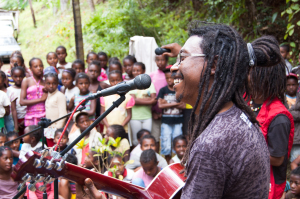 Local musicians performed at the World Lemur Festival in Antananarivo, Madagascar. Photo courtesy of Mikajy Natiora. As we prepare for all the amazing events coming up for the 2015 World Lemur Festival, let’s take a look back at the first ever World Lemur Festival, celebrated just last year from October 25th-31st 2014. The event was the brainchild of Jonah Ratsimbazafy of GERP Madagascar, one of Madagascar’s leading primatologists (and one of our Project Advisors at the Lemur Conservation Network!). The festival was successful in attracting the attention of the Malagasy press, as well as the many lemur fans from around the world. One of the big events in Madagascar even featured a video from one of the world’s most famous lemur fans, entrepreneur Richard Branson. 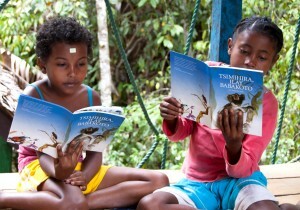 Children read books about lemurs at the celebration at Parc Ivoilina. Photo courtesy of the Madagascar Fauna & Flora Group. 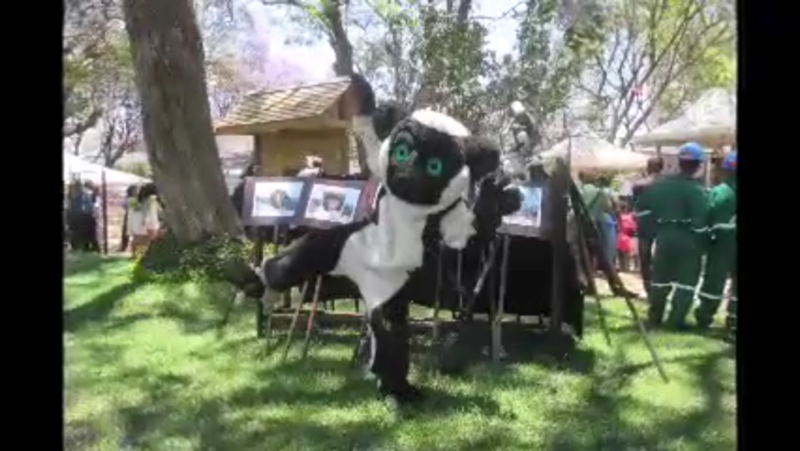 The celebration was created to raise awareness about lemur diversity and highlight critical conservation needs at national and international levels. 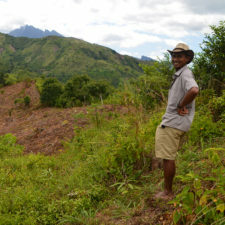 Objectives set by organizers included raising awareness about the value of this unique natural heritage among scientists and the general public, awakening a love and pride of endemic lemur species among Malagasy people of all ages, gender, and social status, improving the economy through tourism and its benefits, and promoting lemur conservation and education worldwide. 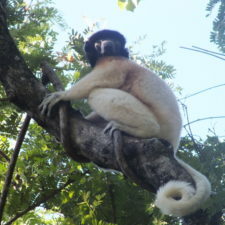 All 22 regions of Madagascar celebrated the World Lemur Festival from October 25th-31st. Celebrations included crafts, storytelling, music, and dancing. MFG celebrates the World Lemur Festival. Photo courtesy of the Madagascar Fauna & Flora Group. MFG hosted a great World Lemur Festival event at the park. 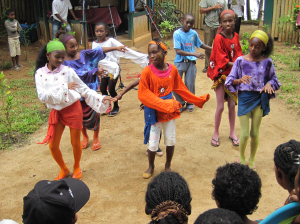 Last year’s event welcomed 200+ children, 30 youth volunteers, and two Malagasy rock stars! The all day event included storytelling from the Ako book series, crafts including lemur masks and bamboo ink lemur drawings (which were hung in the bamboo by the hapalemurs), education team members teaching species characteristics and touring the ecosystems, a dramatic play about being an indri field scientist, and acting out the Ako books. Aside from the creative stations, there were also important speeches, performances from musicians Mika and Pinta, and dancing. The MFG staff and event attendees were star struck by a surprise appearance from a Malagasy rock star and TV crew. After the day’s events, children went on a lemur hike and played animal games. 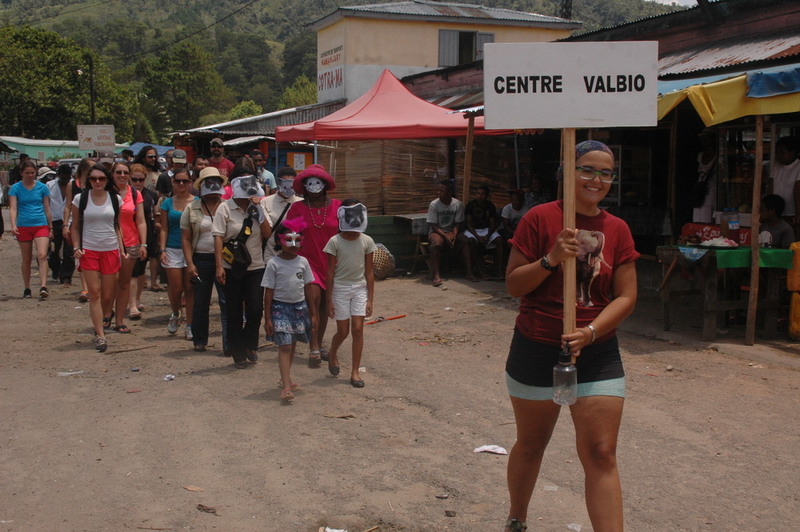 World Lemur Festival celebration at Centre ValBio. Photo courtesy of Centre ValBio. The World Lemur Festival lasted all week at Ranomafana Village, just outside Ranomafana National Park, and was hosted by Centre ValBio, a research station operated by Stony Brook University. A stage was set up in the middle of town for the opening ceremony, which featured many speakers addressing the town about the importance of protecting the lemurs in Ranomafana. The opening ceremony also included children performing songs and dances, a parade featuring people from Madagascar National Parks and Centre ValBio, and a basketball game. The week ended the way it began, with a closing ceremony to signify the end of the World Lemur Festival. 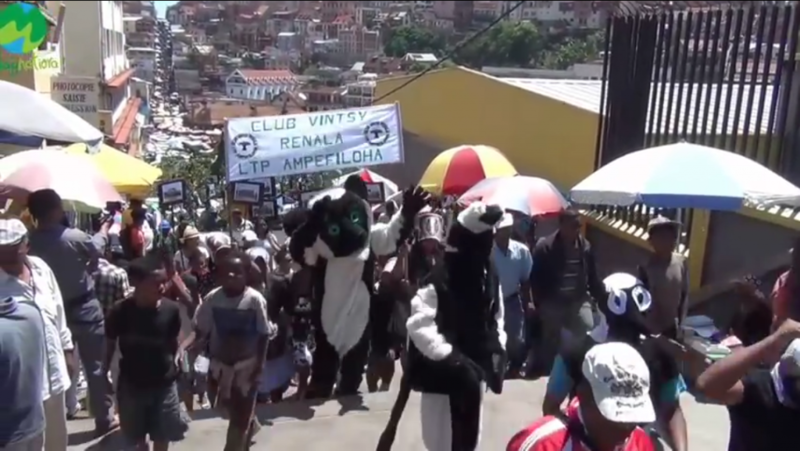 Carnival in Antananarivo for the 2014 World Lemur Festival. In Antananarivo, the capital of Madagascar, events were hosted by Madagasikara Voakajy, Mikajy Natiora, and GERP. An opening ceremony for the World Lemur Festival was held at the Botanical and Zoological Park Tsimbazaza, after a carnival behind Antananarivo Municipal Stadium. From October 27-29, the Rarihasina Tahala displayed a thematic exhibition on lemur conservation, while the Garden Ortana Antaninarenina hosted an exhibition and sale. There was also a presentation at the Carlton Hotel of the book “Lemurs of Madagascar,” a book of 841 pages illustrated with over 680 color photos and drawings, published by Conservation International and the National Museum of Natural History in Paris. World Lemur Festival in Antananarivo, Madagascar. Awareness campaigns and games were held at the Gymnase Couvert de Mahamasina and Tahala Rarihasina Analakely. Great carnivals at Tahala Rarihasina Analakely and the Ortana’s Garden Antaninarenina closed the Lemur Festival on October 31. In the villages around Farankarina Tropical Park (east of Maroantsetra), villagers gathered for the annual Lemurs Festival – featuring dancing, drawing contests, and traditional music. The entertaining and educational event, as well as the 3,950-acre reserve where it was held, is run by Antongil Conservation, a collaboration of British and French zoos. It attracted hundreds of villagers from the surrounding areas and exhibitions helped demonstrate the links between man and nature. 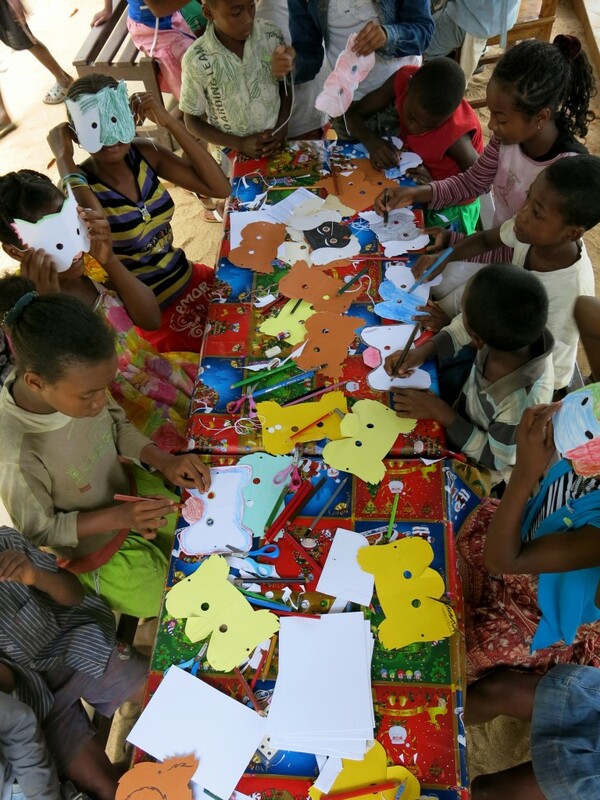 Lemur crafts for the children at the Madagascar Fauna & Flora Group World Lemur Festival in Madagascar. Many zoos and conservation organizations in the U.S., Canada, Africa, Asia, and Europe also celebrated the inaugural World Lemur Festival, making it a truly global event. You can read about the Central Florida Zoo’s Lemur Conservation Day, which was created in conjunction with Jonah Ratsimbazafy’s World Lemur Festival, in this previous blog post. 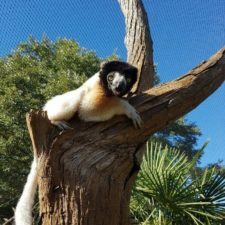 On October 24th, the Houston Zoo in Houston, TX celebrated the World Lemur Festival with a special event for zoo visitors.. There was a fundraising table with various items, including paintings by the animals, for sale, with all profits going toward lemur conservation. 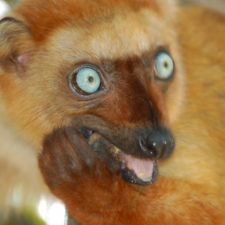 There were also lemur-oriented activities, such as leaping contests and testing your sense of smell. Children took part in face painting, coloring and word searches. 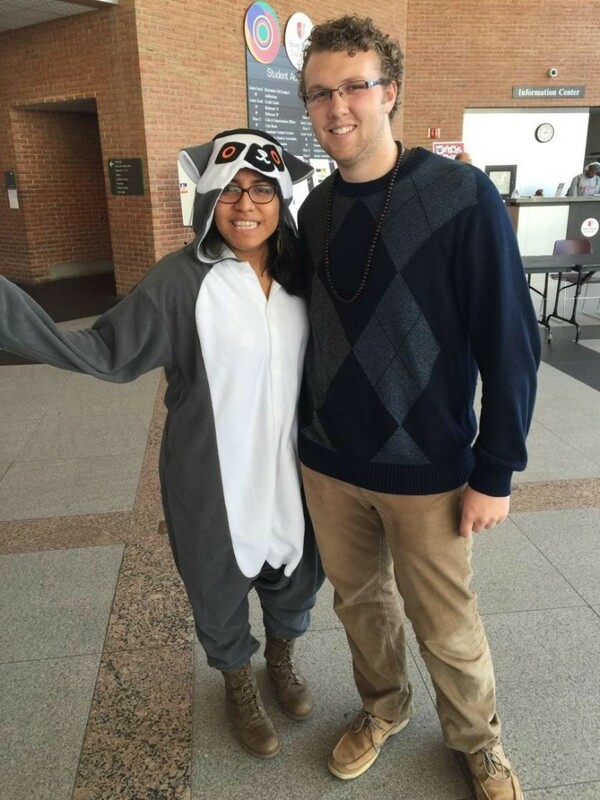 Stony Brook University held Hug a Lemur Week. Photo courtesy of Stony Brook. Stony Brook University in Stony Brook, NY, which operates Centre ValBio in Ranomafana, celebrated the World Lemur Festival on campus with Hug a Lemur Week. Every day of the festival, researchers and their lemur-mascot friends were on campus handing out candy and educating students about lemurs. Students could hug a lemur and take a selfie with them for a chance to win prizes by sharing photos on social media with #hugalemur. A table was set up at the Student Activities Center where lemur researchers from the university were available to answer questions about their work, raise money for lemur conservation, and give out all kinds of goodies. No matter where you are in the world, I hope you find a way to celebrate this year’s World Lemur Festival, and make a pledge to play your part in the ever-growing story of lemur conservation. Stay tuned to the Lemur Conservation Network; we will let you know what events are happening around the world in the coming weeks! So far, we know there are events throughout Madagascar, as well as in Hungary, the UK, several locations in the United States, and more! Tonga soa to the World Lemur Festival! Learn how you can have your own event and learn about some of this year’s upcoming events! Innovative Fundraising: Creating Bracelets for Lemur Conservation at Just 12 Years Old!